James Earl Jones: [introducing the Carnival of the Animals] Here the sensitive strains of impressionistic music combine with the subtle artistry of the animator to finally answer that age old question: What is man's relationship to nature? James Earl Jones: Oh, sorry... That age old question: What would happen if you gave a yo-yo to a flock of flamingos? James Earl Jones: Who wrote this? Mickey Mouse: Mr. Levine! Okay, Mr. Levine, everybody's in place for the next number. Donald! Oh Donald! James Levine: When we hear Sir Edward Elgar's "Pomp and Circumstance" we think of a graduation ceremony. Mickey Mouse: Donald, where are ya? James Levine: Actually, Elgar composed it for many kinds of solemn events. Mickey Mouse: Oh, sorry, Daisy! James Levine: ...of Noah's Ark, with one slight twist. Mickey Mouse: [Knocking on door] Oh, Donald Duck! Mickey Mouse: Donald, it's me, Mickey. You're on in 30 seconds, hurry. Mickey Mouse: [Peeking behind a wall] Psst! Okay, Jim. He's on his way. Go to the intro. James Levine: Ladies and gentlemen, "Pomp and Circumstance," starring Donald Duck. Bette Middler: Hi. 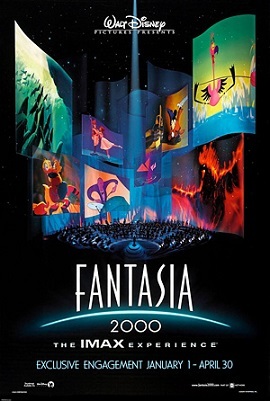 You may not know this, but over the years the Disney artists have cooked up dozens of ideas for new Fantasia segments. Some made it to the big screen this time, but others - lots of others - how can I put this politely?... didn't. Steve Martin: You know what's amazing is that many of these musicians are playing for the very first time. Thanks to Steve Martin's "Master Musician Home Study Course". More about that later. Steve Martin: Oh! Oh, sorry. Could I have another stick thingy, please? Oh, and camera back on me. Camera back on me. Ca... Am I done?